Air mattress popularity is on the rise thanks to its balance between comfort and convenience. Peoples appreciate its benefit to their sleeping posture and how quickly and effortlessly the entire thing can be stored away. Yet as with usual factory built products, you may have to add something of your own to be truly relaxed on the air mattress. If you happen to in need of hints to do that then you are in the right place. This article can offer you several useful pieces of information on how to make an air mattress more comfortable. Lying directly on the mattress might make your skin feel inconvenient and affect your sleep. An extra cushion in the form of a foam or latex topper can come in really handy here. Whether you feel the surface material is too hard or too soft, the topper shall fix it in a manner that suits you the most. Or if you hate making separate purchases, just get an air mattress that is equipped with a topper from the start. 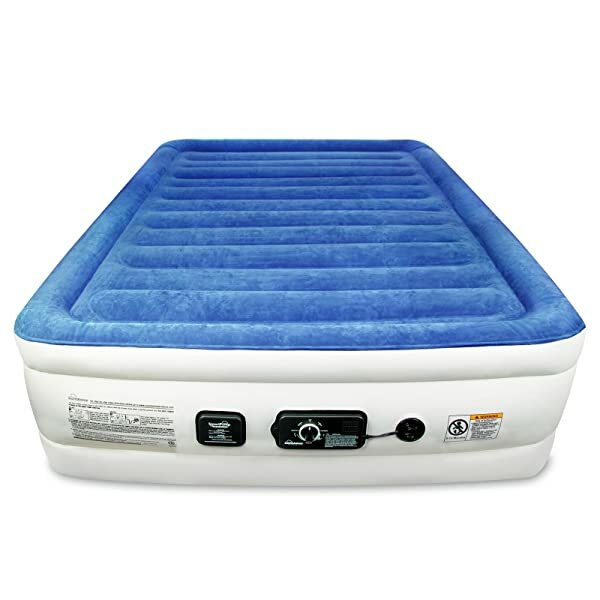 To put it short, the air mattress is just an airtight structure that when fully inflated will resemble a bed or alike. The use of air means the air mattress is more or less vulnerable to temperature changes. If the weather is hot, the air inside would be warm. And if the temperature is low, the air could get cold. This greatly impacts your experience on the air mattress if you just use it right away without using bed sheets and covers. Cover the sleeping side with them should let you sleep in comfort and avoid the issue of temperature changes. The bottom side of the air mattress is not good at dealing with hard and uneven grounds. Annoying noises can be heard when you turn your body due to the friction between the bottom portion and the floor. In order to solve the phenomenon, pick a flat position to locate the mattress and slide in a rug or a mat underneath. This should prevent it from sliding away on its own and at least reduce the squeaky sound. If possible, you can try to get mattress completely off the ground with the help of a box spring or a stance. There won’t be any more contact with the ground so the sliding and the squeaking are eliminated. It considerably increases the overall height which should make it easier for you to get up, especially when you have knee problems. The elevation of the mattress also provides you with another benefit. Now the surface has no thermal relation with the mattress. So even if the floor gets really cold, you can still sleep comfortably. You can never underestimate the usefulness of a pillow when it comes to a good sleep. No need to look for a fancy looking one, just grab a functional and durable pillow for your air mattress. As long as it can support your head and permit proper alignment of the body spinal then that product is sufficient. If you tend to move and roll around in your sleep, a headboard would be helpful to keep the pillow from falling. You can improvise by positing the mattress against the wall or a cabinet. An air mattress can’t work well if there is a leak so give it a check over once in awhile. Yet if there are no visible holes, you may end up with a partially deflated mattress after some time in use nerveless. It’s the reason why you wake up one morning with back pains or neck aches. If you intend to use the air mattress regularly, ensure that it’s properly inflated before use. After every couple of day, pump it up again to maintain an ideal performance. All air mattresses, even high-end models, will leak their air eventually so keep an eye out. For people that want a comprehensive answer to this, three are air mattresses that come with a smart pump. The built-in sensor can sense any loss of the air and start the pump to fill it back. You can casually sleep all the way to sunrise knowing that your body will wake up fresh and energized. Certain products in this category are a bit expensive but if you look around carefully, you can get one that fit your wallet. Some of them even come with a price tag that is very competitive compared to an average model. Obviously, you can have a good time on the air mattress if it’s damaged. From pointy furniture to sharp tools or even your pet, they all pose potential threats to the mattress integrity. If you want to sleep comfortably, make sure that you shield the air mattress from any danger. In the case that you need to repair it. Remember that the mattress material is stretchy and not easy to deal with if you are not experienced. Sending the mattress for maintenance is probably the logical course of action at that time.